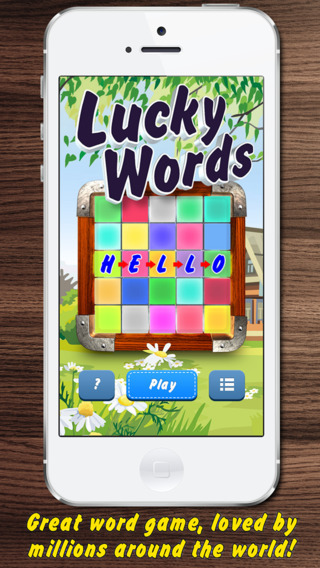 Lucky Words (Балда) - great word & educational game for clever players! - "We play each day wtih my girfriend. It's fun and useful!" Start with 5-letter word on 5x5 playfield. Add one letter per turn and try to compose a word, turn after turn with your opponent, untill playfield is filled up. It usually takes around 10 minutes per one game. ● New game mode - "Guess a word!" ● Hint and extra minute! Use WiFi or 3G for reliable connection. Playfield consists of 5x5 squares. Players move one after another, each have 2 minutes per turn (1 minute with Trubo-mode). On your turn, you have to place a letter on vacant square and compose a word, which contains this letter. The word must be in the game's dictionary (noun, verb, adjective or adverb in singular/infinitive form or plural if not used in singular form). Words in one game shouldn't repeat. One square may be used no more than once per word. Number of points equals number of letters in the composed word. A player, who places a letter on a prize square and composes correct word is given 1 or 2 additional points. At the end of the game a player with more points wins. Invite your friends or challenge the whole world! 1. Try to remember which friends of yours have iPhone, iPad or iPod. «Launch App Store and enter search request Blockhead Online. If you have an iPad, then look for results for iPhone." 3. 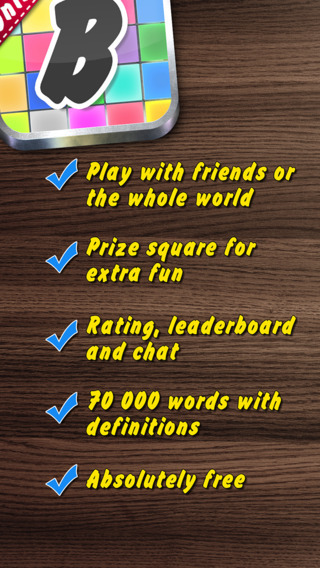 After the launch of the game your friend will be prompted to sign in to the Game Center. Your friend should tell you his(her) nickname or email used for the Game Center. 4. On your device launch Game Center app and sign up if you haven’t yet. Go to «Friends» section and add you friend by his(her) nickname or email. You friend should receive a notification and should confirm. 5. Start the game. Tap «Play», «Play online», and then «Invite». Choose your friend from the list and send an invite to play. Wait till your friend accepts, repeat later or find another friend.